(FinalCall.com) - As if having record-setting storm patterns and deadly heat waves increasing across the country wasn't enough, now multiple states have been rocked by a recent earthquake and Hurricane Irene has left a trail of destruction on the East Coast—including deaths, widespread power outages and flooding. According to a mid-August report by the National Weather Service, a record-tying nine $1 billion weather disasters has rocked the country's economy this year to the tune of $35 billion. By June, the nation had already experienced $20 billion in losses due to thunderstorms, doubling the national average from the previous three years. The agency also reported that U.S. natural disasters have tripled in the last 20 years with a record 250 striking last year. This year has been tormented by droughts, wildfires, multiple tornadoes and blizzards. “The nation is increasingly vulnerable to extreme weather. It doesn't take a wizard to predict that 2011 will go down in history,” said Jack Hayes, director of the National Weather Service. At Final Call press time, Irene took the lives of at least 20 people in nine states after making landfall on Aug. 27. Approximately four million people were without power and U.S. officials report that wind damages will cost at least $1 billion. Mass evacuations took place in many states and fear for the worst caused New York City to be completely shut down for the first time in its history. “I do want to underscore that the impacts of this storm will be felt for some time, and the recovery effort will last for weeks or longer,” said President Barack Obama during a press conference on Aug. 28. Some experts believe that La Nina, the cooling of the Pacific Ocean, or mere coincidence is behind some of this destruction. 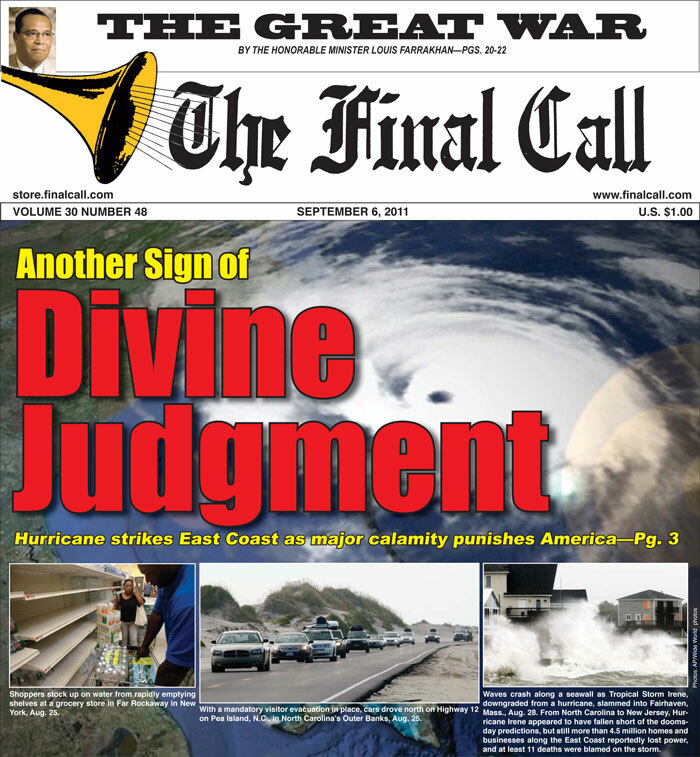 However, Nation of Islam members say this is God's Judgment coming down on America as declared by the Most Honorable Elijah Muhammad and the Honorable Minister Louis Farrakhan. “That earthquake should serve as a sign and a warning that Almighty Allah is not pleased with the direction of this government. Particularly as they ignore the needs of the poor and the war path they are on,” says Student Minister Ishmael Muhammad, National Assistant to Minister Farrakhan in Chicago. “The enemy does not want the masses of the people to hear the prophetic voice of Minister Farrakhan, so they deliberately work to keep his messages from reaching their ears. They know that Minister Farrakhan will help those who call themselves Muslims and Christians see that what is written in the Bible and Qur'an is being fulfilled right now,” said Ishmael Muhammad. According to news reports, a rare and strong 5.8-magnitude earthquake hit the East Coast on Aug. 23 for approximately 30 seconds. Some reports say due to the hard and brittle ground of that coast, the tremor could be felt as far north as Canadaand as far south as Georgia—starting first near Richmond, Va. It has been recorded as the most impactful quake to hit that area since 1897 and was followed by three aftershocks over a 24-hour span, measuring between 2.0 and 4.9 on the Richter Scale. “I'm not surprised that an earthquake took place there. First because it is written in scripture of earthquakes taking place in diverse places and also many fault lines run throughout America. We have a fault line running from Houston to Dallas. We're just only accustomed to seeing earthquakes on the West Coast,” says Captain Khallid Greene of Houston Inner-City Emergency Response Team. “People were shaken up here in D.C. by that earthquake,” says Student Minister Abdul Khadir Muhammad of Washington, D.C. He noted that grocery stores were being cleared out in preparation for Irene and hardly anything was left on the shelves. “That (earthquake) is nothing compared to what is coming. I saw some people making light of the situation and telling jokes but as the Holy Qur'an tells us and the Hon. Elijah Muhammad warned, the land would be curtailed on all its sides,” said Ishmael Muhammad. With all of the present disasters, Mr. Greene says his team is seeing an influx of people signing up to take advantage of preparedness training. The problem is not enough Black people taking interest, he says. “It is strange how every time a disaster happens, the majority of the images we see on television are Black people having to be saved. Where are the trained men and women in our community? We have to be trained not only to survive but to rebuild after the disaster occurs. Get our families prepared,” said Mr. Greene. Newark, N.J. Mayor Cory Booker told The Final Call, “We have mostly down power lines and a lot of residents are without power. This presents a real danger for senior citizens, newborns and people needing treatments. We got a lot of property damage due to flooding and fallen trees. We have road damage and even some of our parks, which has severe flood damages. We had to do a lot of rescues over the last two days from people stranded in their cars,” he added.